Quinoa is that wonder food we began hearing about a few years ago. Its health benefits are actually quite unique. This seed, often considered a whole grain, is a good source of manganese, magnesium, iron, riboflavin, and copper and can help prevent migraines. Its also gluten free. But maybe the best thing about it, is that it contains a complete amino acid protein, which is great for any vegetarian! Here is a quick and easy way to incorporate quinoa into your day. 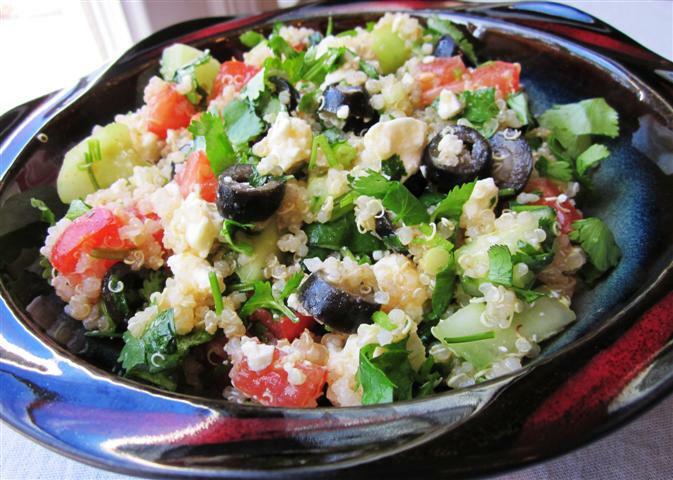 The original tabouli is a Lebanese salad made with bulgar wheat and parsley. I like the taste of cilantro far better, so I have used that instead. You may use either or a mix of both. Enjoy! Rinse the quinoa in a strainer. Heat 1c water and 1/2c quinoa together in a small pot over med-high heat(I like to add 1 bay leaf and a little salt to the water). Cover. Once it comes to a boil, reduce heat to medium-low and cook for 10 minutes. Once the little pod splits from the side of the seed and curls, it is done. Fluff with a fork (remove bay leaf) and let cool slightly. Mix together all the other ingredients in a large salad bowl. Add the quinoa to it, and adjust the seasonings. You can eat it immediately, but it will absorb flavors if you can let it sit for a little while in the fridge. I also prefer it cold.